With renewed debate in Israel over its immigration laws, few places reflect the experience of its largest immigrant community as closely as one former luxury hotel in a south-east corner of Jerusalem. After closing its doors to holidaymakers and honeymooners in the late 1980s and reopening as an absorption centre, the Diplomat in the Arnona district became for many emigres a transit point to a new beginning - an Israeli Ellis Island. 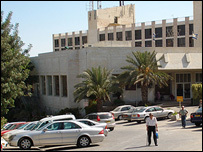 "In 1991, when the floodgates opened, many former Soviet Jews wanted to live in Jerusalem, which they knew as their spiritual home, but they had nowhere to go, so the government just put them in hotels, like this one," said Alice Jonah, the Diplomat's semi-retired Cultural Director. "Over the years, they closed the other hotels and people who couldn't find any other accommodation moved here, which, for many of them, is a blessing." At its peak, the hotel housed some 1,800 "guests", including hundreds of Ethiopian Jewish immigrants, spirited to Israel in Operation Solomon in May, 1991. "It was a wonderful, exciting day when the Ethiopians arrived," recalled Ms Jonah, "but the experiment didn't work out too well. There was such a disparity between the two groups." The government dealt with the two communities differently, paying for the Ethiopians' food and rent, while the residents from the former Soviet Union were given a small payment but had to largely fend for themselves. Tensions boiled over in a violent brawl in the summer of 1991, after which the Ethiopians moved out and were absorbed into the country. For the "Soviets" however, adjustment came harder, and 16 years after it opened as a temporary shelter, the Diplomat remains a little part of Russia and home for some 600 people. Russian culture is all-pervasive at the hotel, now ageing like most of its residents. The building houses a Russian library in which eminent Jewish writers from former Soviet republics peer down from portraits on the walls. Residents, many of them WWII veterans, commemorate Red Army Day, the anniversary of the Soviet Union's victory over Nazi Germany. Russian, rather than Hebrew, is still the predominant spoken language, a barrier to integration for some and symptomatic of a wider feeling of nostalgia for Russian culture. Judaism, and the study of Hebrew, were however severely repressed for decades under the Soviet regime. "If I had tried to learn Hebrew in Russia, I would have ended up in Siberia," said 77-year-old Larisa Komolov, a former geometric engineering teacher from Moscow. 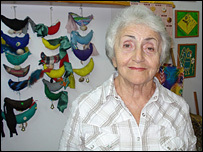 Ms Komolov said she emigrated to the Jewish state because of rising anti-Semitism in Russia. Ironically it was a recent manifestation of hatred towards Jews among some immigrants from the former Soviet Union which has spawned calls for the country's immigration laws to be tightened. According to Israel's Law of Return, anyone with at least one Jewish grandparent is granted automatic citizenship rights. The start of the collapse of the Soviet Union facilitated a mass exodus of Jews, and more than a million of its citizens settled in Israel under the law. Many of those immigrants however had little or no connection to Judaism and have failed to assimilate. This situation has bred feelings of alienation and has been given by some as a reason for the emergence in a Tel Aviv suburb this year of an eight-strong neo-Nazi cell, all of whom were from the former Soviet Union and two of whom had Jewish mothers. When they arrived in Israel, many of the Diplomat's older Jewish residents also had little or no knowledge of their religious heritage. "As children they were exposed to Judaism, but for years it was forbidden and just stayed dormant in the back of their minds," said Ms Jonah. "Here, when they saw Jewish customs and religious holidays again some of the older people underwent a kind of renaissance. They rediscovered religion and they loved it. It gave them a new lease of life." Meanwhile the hotel itself faces an uncertain future. Its lease expires in 2009 and it could finally be forced to shut. "The government will have to find a place for each and every person here, but it will not be easy, as they have nowhere else to go," said Ms Jonah. For some, relocation may bring them more within the fold of Israeli society, but for many of the Diplomat's elderly residents it will be a move many years too late.